The BMW M Models have been a mainstay in the European Performance Car Market since the Mid-80’s. The M3 is not the first M Model BMW produced, but it carries the strongest following in the BMW Performance community. Starting with the E30 M3 followed by the E36 M3, E46 M3, E9x M3, and now currently the F8x M3/M4, BMW continues to create a well performing vehicle right out of the box. However, there’s always room for more power. A few weeks ago, a customer contacted us and asked if we can build his 2012 E92 M3 Coupe. He wanted to create a vehicle that broke necks in both aesthetics and performance. We felt confident in the task and arranged a meeting with the customer to discuss what his plans were. Our customer decided he wanted to start off with the Performance Mods for the vehicle. Off the bat, he was certain he wanted to go the Forced Induction route with a Supercharger. To make sure the internal condition of the engine was up to the task, we has a sample of the Engine Oil sent out to Blackstone Labs for analysis. The 4.0L V8 (S65) in the E9x M3 has a known history of Connecting Rod Bearing Failure and having the oil sent out to Blackstone for analysis is just good for peace of mind. Once we got the positive results from Blackstone Labs that everything was okay, it gave us the green light to move forward. Before proceeding with the modifications, we needed to get baseline numbers for the M3. On our Mustang Dyno, the M3 put down 309hp and 239tq at the wheels. The horsepower graph shows nice linear power through the full RPM range. The torque graph is almost completely flat with peak torque being reached at ~3,800rpm, then slowly tapering off at ~6,800rpm. With these baseline numbers, you could already tell this engine’s power characteristics would benefit highly from a Centrifugal Supercharger. For the Supercharger, the customer opted to go with the VF Engineering VF620 Supercharger Kit. 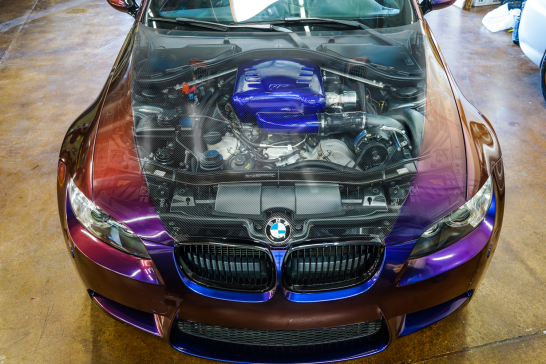 Using a Vortech V3-Si Trim Centrifugal Supercharger supplying 6.0-6.5psi of Boost, Upgraded Fuel Injectors, Custom Water-Cooled Intake Manifold, and custom ECU Software, it takes the M3 from 414hp and 300tq to (up to) 625hp and 400tq at the Crank. With as much air the Engine is taking in from the Supercharger, the Exhaust gases need somewhere to go…and quickly. To handle the tasks of a free-flow exhaust system, the customer opted to go with the Complete Evolution Line Exhaust System in Titanium from Akrapovic. Akrapovic advertises to not only get you an extra 22hp (@5,700rpm) and 26tq (@4,900rpm), but also saves almost 53lbs over the factory BMW exhaust system. The first stage of the build consisting of the Supercharger and Exhaust System took about 2.5 Days to complete. As with almost all aftermarket parts, some modifications did need to be done for a perfect fit. Aside from some shaving to a few of the components to the Supercharger Kit, the entire install went fairly smooth. After completing the installation and starting it up for the first time, you could already tell this car is a whole new beast. After taking testing out the car on the street, we put it back on our Dyno to see what the numbers are at now. With the new mods, the M3 is now putting down 459hp and 321tq at the rear wheels. The horsepower curve is now a lot steeper on the graph with peak power right at the top before redline. The torque curve now climbs more and keeps going up all the way to redline. These power numbers will surely put a smile on anyone’s face. We can’t wait to tackle more things on the customer’s to-do list with his M3. Stay tuned, guys!